Craig H, a fellow Uralista who drives a 2007 URAL Arctic Patrol rig and I met up at his house around 8:30 this morning and we headed out towards the Deckers, CO area to check out possible sites for the upcoming Shoot and Scoot Event. This event is open to all riders but will consist mainly of URAL riders, their rigs and assorted monkeys. The area we were looking at is inside National Forest lands so as long as you follow the rules and are safe, it's OK to shoot one's firearms. 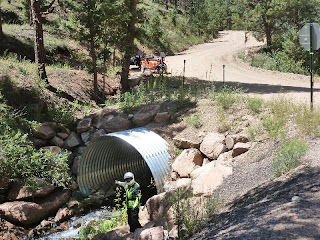 The only site that both Craig and I were sure of is located on Douglas County Road 126. We took US 285 to the town of Pine Junction and headed south on CR126, through the towns of Pine and Turkey Creek. You arrive at the shooting site in short order. We found the site occupied with several cagers, plinking away at targets. Not a bad site per se, but it could get crowded I think. One of the folks there was this older gentleman who was watching his nephew do some shooting. 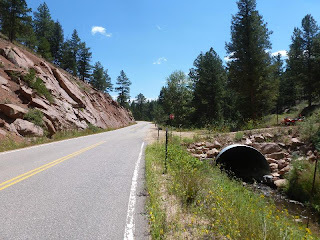 He told us to check out Forest Service Road 211, further south nearer to Deckers and so we did. A few miles further south, we managed to find the turnoff for FSR 211. It is located 4 KM north, off of CR126, from Deckers. This FRS is a narrow winding road full of loose dirt/gravel and tight blind curves, one has to be watchful of cagers rounding these blind curves! This is the same road one takes to get to the Cheesman Water Reservoir. Just before you enter the reservoir area though, there's a right turn if you want to stay on FRS 211. 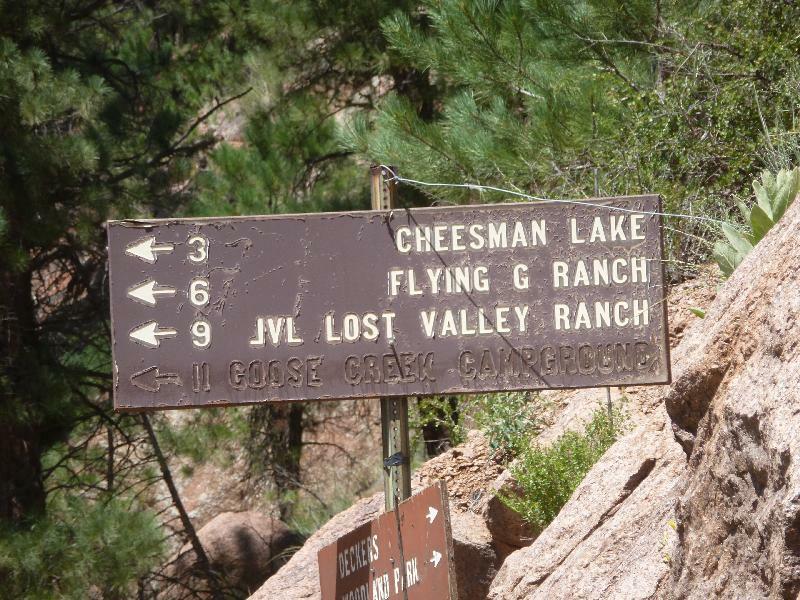 There's signs pointing to the right announcing both the Flying G Ranch and the Lost Valley Ranch. The road continues to be an enjoyable dirt road with some steep parts, plenty of sand and gravel to go with the packed dirt of course. A few kilometers down the road, I spotted a trail heading off the right and took the rig down it. Craig followed me in and we ended up at a small turnaround area bordered by trees and a steep rocky dropoff. There was evidence of previous use of this spot as a shooting range, and we checked out possible firing positions and such. This would end up being the "backup" firing area. Leaving this spot, we continued on FRS 211 for a few more kilometers, I could see we were approaching a small mountain ahead. targets over on the west side of the road. Not a bad site but no shade. As we got nearer to the base of the above mountain's rock formations, we spied a trio of guys shooting off to the west side of the road in what looked like to be an ideal shooting spot. It had a good backstop in the form of a set of two hills with a narrow draw between them. We stopped, and chatted with the guys since they'd wandered over to check out the rigs! We had a good long chat with them, even got to fire one of their Russian Moisin rifles (quite a kick to it). The spot had nice shady areas, easy target emplacement spots and no way you should accidentally shoot at traffic on the road. This ended up being the primary spot for the upcoming shoot and scoot! Plenty of parking space, shady trees and a good back stop area. The guys were RJ, Will and Alexander. RJ and Will are Stunt Actors, first ones I've met in person! We told them, as we left, that we'd invite them for the shoot on the 24th of the month. The guys had quite a few weapons with them, lot of them Russian, to include the Moisin. The riding on this FRS 211 is not too challenging, conditions are OK, with some washboarded sections and some really loose gravel on the curves. The terrain is suitable for trucks and cars of course, and we saw several of them barreling down the road raising quite the large dust clouds. The sunflowers should be full size by the 24th. 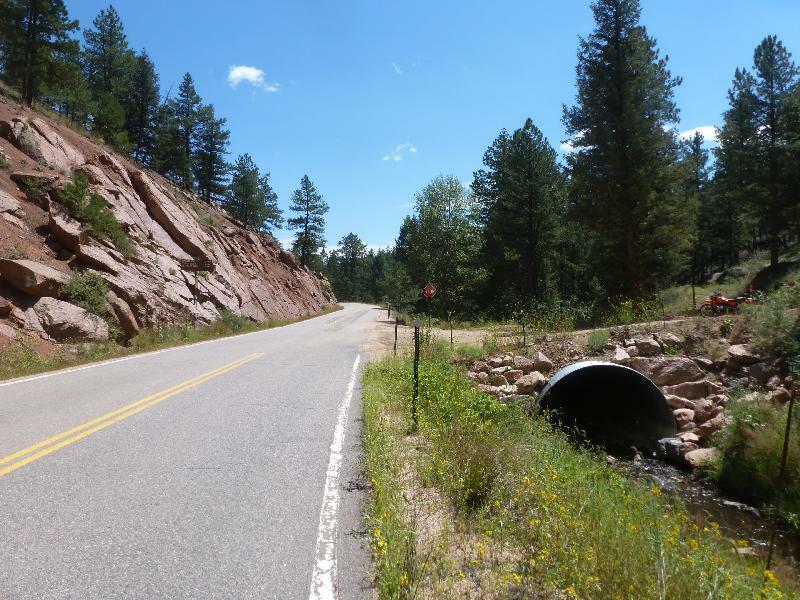 Craig and I keep riding, taking the turnoff for Sedalia, still staying on CO67 which becomes a slightly hilly dirt road. No big challenge for the URALs this road, just easy curves and sedate inclines until you reach the settlement of Sprucewood. 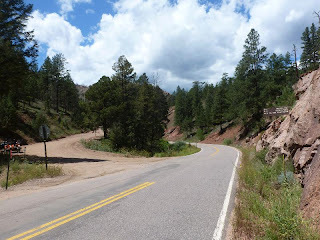 From Sprucewood, it's paved roads with twisting turns and noticeable slopes all the way past the turnoff to Rampart Range Road and then to Jarre Canyon where curves get even tighter for a couple of miles before you debauch into the valley before Sedalia. View of Castle Rock with Pikes Peak in the background. Good day of riding, not too hot until near the end of the ride. We found a good shooting spot and both our rigs did just fine. 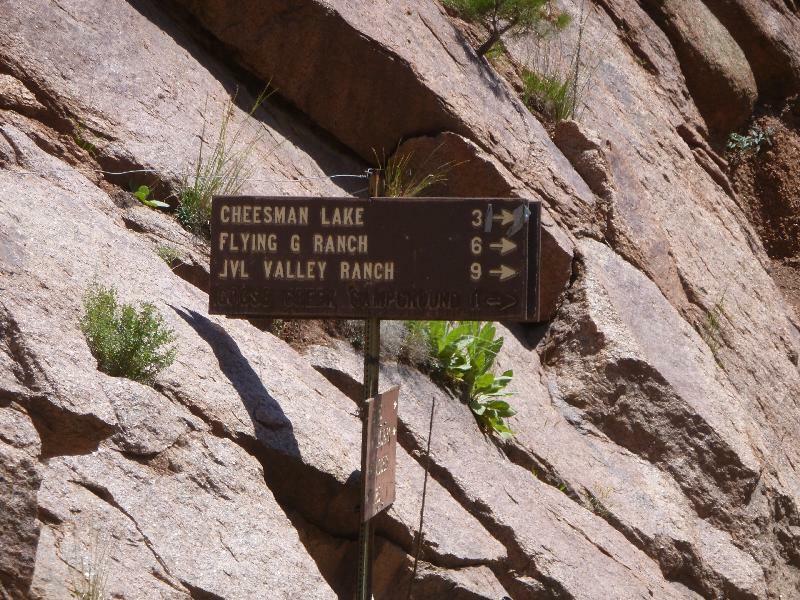 Once on FRS211 continue 3 km till you reach the group of mailboxes and the signs that point to the right for Flying G and Lost Valley Ranches. Turn right to stay on FRS 211. If you go straight, you will dead end at Cheesman Reservoir. Continue on FRS211 for 8 KM, the shooting site will be on left side of the road. The Denver-based contingent will gather at the O'Brien Cafe around 7:00AM for breakfast, leaving as a group around 8:30AM. We will take CO67, through Jarre Canyon, Sprucewood, and end up in Deckers about an hour later. The CO Springs contingent could, I suggest, take US24 to the junction of CO67, and head north on this road till you reach Deckers. From there, follow the above instructions. this is where you turn RIGHT onto FRS 211. The sunflowers make a nice contrast to the orange. I recon no motorcycles were harmed in the making of this trip? Not sure I would feed comfortable riding around with people firing guns. But I guess you're safe when your vehicle is orange. And here when you said shoot and scoot I thought you meant taking pictures.